The stocks of Vermilion Energy (TSX:VET)(NYSE:VET) and Sierra Wireless (TSX:SW)(NASDAQ:SWIR) fell more than 30% in the past year, as shown in the chart below. However, they have strong upside potential for 2019. VET data by YCharts. One-year price actions of TSX:VET and TSX:SW.
Vermilion stock is down by more than a half from five years ago. In the period, Vermilion experienced WTI oil for more than US$100 per barrel down to less than US$30 per barrel and back to the US$45-per-barrel level today. However, Vermilion has maintained its dividend and increased it four times since 2003. There’s no doubt Vermilion’s stock price has a close relationship with oil and gas prices. Pundits blame the poor stock price action on other reasons, too, such as the fear of a global slowdown that can trigger from the Federal Reserve’s benchmark interest rate hike to 2.5% from the previous 2.25%. Sierra Wireless has always been volatile. Here’s its 10-year price action with the stock making a respectable climb of 180% over the period. SW data by YCharts. The 10-year price action of TSX:SW.
One reason for Sierra Wireless stock’s volatility is that it’s highly unpredictable, as LTE and 5G networks and the applications of the Internet of Things are still evolving and could take several years or longer to mature. At $28.16 per share as of writing, Vermilion stock trades at about 4.7 times cash flow, while the global oil and gas producer normally trades at about 8.5 times cash flow, which represents a target price of about $51.50 per share. Thomson Reuters analysts have a $49.40 per share mean 12-month target on Vermilion stock, which represents 75% near-term upside potential. Meanwhile, Vermilion offers a monthly dividend, equating a 9.8% yield that’s relatively safe compared to that of most other oil and gas producers. Sierra Wireless trades at a price-to-earnings ratio of about 14.7 at US$13.36 per share. Reuters analysts have a US$22.80 per share mean 12-month target on Sierra Wireless stock, which represents about 70% near-term upside potential. 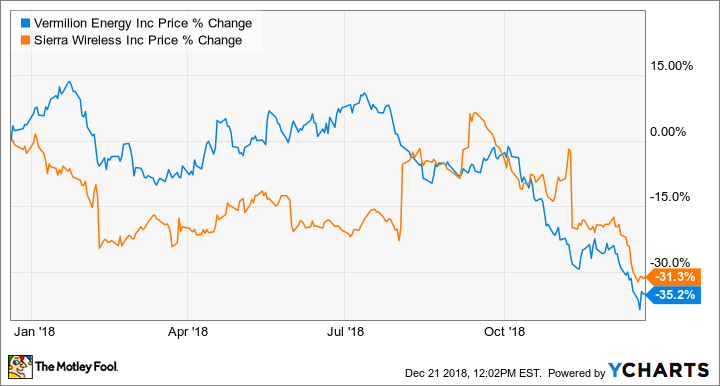 Although they’re losers this year, the stocks of Vermilion and Sierra Wireless can be huge winners in 2019 or beyond. However, investors need to be able to withstand their volatility and be very patient. Vermilion enjoys higher pricing from its Brent oil and European gas production. That’s why it tends to fare better than its North American peers. It is led by quality management that has a focus first on the balance sheet, second on the dividend, and third on production growth. Sierra Wireless is an Internet of Things leader in device-to-cloud services and solutions. Furthermore, it’s an innovator with integrated Internet of Things solutions using 4G LTE-A, LPWA, and 5G. Since it was founded in 1993, it has shipped more than 160 million devices worldwide with customers in more than 130 countries. 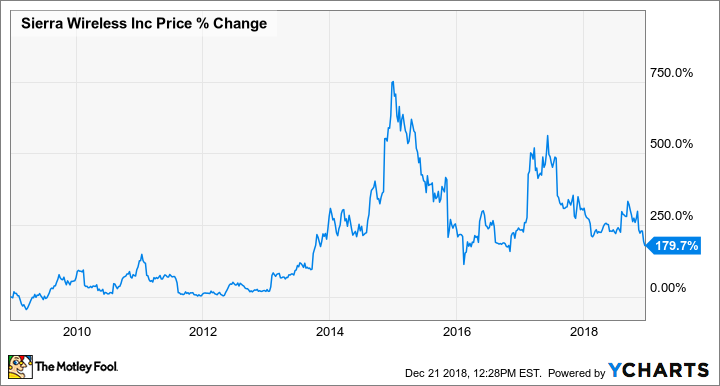 If you have a strong belief in the comeback of oil or in the new era of the Internet of Things, consider Vermilion and Sierra Wireless at basement-cheap valuations now! If they’re not the kinds of stocks for you, here are some safer Foolish ideas to consider for the Boxing Day sale that the market is offering us. Fool contributor Kay Ng owns shares of Sierra Wireless and VERMILION ENERGY INC. David Gardner owns shares of Sierra Wireless. The Motley Fool owns shares of Sierra Wireless.